Then I could use the search feature in Address Book to search for “car” and it would show up… right? Well, it did show up indeed, along with 87 other entries in my case. Why 87 and not just the one? Entries that contained words or names like Carrie, cartoon or San Carlos all show up as well. My first thought is use Twitter style hash tags, so I would have used #car and #automotive instead. Would have been an excellent solution if Apple’s Address book didn’t completely ignore the hash (#) symbol when searching! A quick test shows it ignores almost all punctuation so that theory was out. While I was updating my tags I decided it was also time to separate my tags from the Notes field. There are pro’s and con’s to this: If I leave the tags in the Notes field I don’t need to enter Edit mode in order to make changes. If I put it in any other field I’ll need to click “Edit” then make the changes and exit edit mode. Not a big deal, so if I was going to use a different field, which one should I choose? 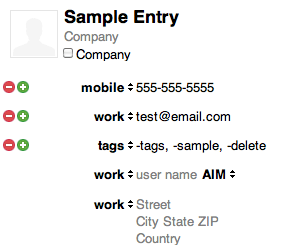 You can add that “tags” field to the default Address Book Template so all new cards will include it by default. This method also allows me to create Smart Groups of everyone that contained a specific tag. The “Related Names” field isn’t included in the list of available fields to search, but if you just search for tags in the “Card” it will pick it up. Side note: When editing the Smart Group I have to click off of it and then back on to it for it to update the list of cards within the group. This method also allows for searching multiple tags at once. Just always remember to enter your tags with a hyphen as the first letter and separate multiple tags with spaces. I like this method because if I search for “delete” I will see every post that contains that word, including this one that was tagged “-delete” … but if I search for the tag “-delete” I will see ONLY the entries that have the “-delete” tag. FTP Error: 200 TYPE is now ASCII … Solution! As usual, this blog is more a notepad of sorts to remind me of things if I need them again in the future. And it’s always a good thing to post them publicly in case others experience the same problem. I searched around for a while and never did find the solution for the cause, tried all kinds of things (Switching from Default to Active or Passive FTP mode, trying different encodings, deleting my bookmark and rebuilding it, etc.) and nothing worked. Then I finally figured out the problem! I had copied and pasted the password out of my password file, and when I selected it I accidentally included the line break at the end of the password. So what was being entered in the password field was the password plus a line break. Simply re-entering the password without the extra line break fixed the problem. In order to have Cyberduck ask me for the password so I could correct the error, I simply had to load up “Keychain Access” and delete the stored copy of the password. Clicked my bookmark again, entered the correct password, and I was in! Hope that helps you if you had the same problem! Upper Sideband on 2 Meters? I have a calendar of all of the local nets that I’m aware of or might be interested in checking in on, and one of those was the 25-25 Net. They meet on Wednesdays at 8 pm on 144.230 MHz USB for check ins and some Bay Area ragchewing. I always thought the net sounded interesting, just never got around to checking in before. This evening Ellen and Daria were not home yet and about 15 minutes before the net was due to start I decided I might as well try it out. I haven’t been doing a whole lot with radio other than local 2M/440 repeaters, so it would be worth trying something new. I quickly pulled my Diamond X30A down off of my home fiberglass mast, and grabbed one of my shorter masts, threw those in a backpack with some antenna cable and my Yaesu FT-817, got a leash on the dog and hopped in the car. Headed up to the top of Mount Hermon and tried to throw all the pieces together quickly while monitoring the net with my HT. If you find you’ve been doing the “same ole thing” on radio and haven’t done anything new, there is plenty out there you can try! CW? APRS? Echolink/IRLP? Give them a try! This year I didn’t make it to any of our local field day sites as I did last year, but that’s not to say I didn’t see the sites! Just like last year I went ahead and grabbed my plane and did a short flight over some of the field day locations. As amateur radio operators we embrace radio as a mode of communication that continues working when many other methods may fail. Telephone lines may go dead, the power goes out, and computer networks cease to operate, yet radio waves continue moving at the speed of light. Well prepared and trained operators, along with their equipment, stand at the ready when other methods fail. However, not all communications emergencies look exactly the same, and as skilled communicators it is always good to have as many tools available to us as possible to deal with the various types of situations we may face. The focus of this article is to talk about one piece of that communications puzzle: notifying your club or ARES group members that their services are needed. There are certain types of emergencies that everyone in the community would know about right away: an earthquake, a tornado, a wildland fire, or similar event. But there are other types of emergencies where radio operators are needed but that aren’t quite so obvious. What if the land line phone system goes down at a local hospital or county facility? 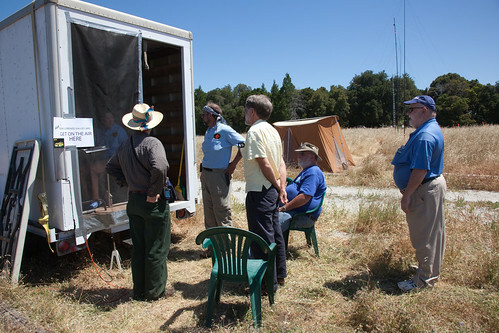 Or if a shelter could use radio operators for a localized incident. How do you quickly spread the word to your radio volunteers that their services could be utilized? Ideally of course you would just put a call out on the local repeater and an abundance of operators would instantly appear ready to operate. But we all know not everyone can monitor their radio 24/7. So the next step traditionally taken is the phone tree. Someone gets out a list and starts dialing phone numbers one at a time. There are some computer aided systems to ease this phone tree process, and several of those charge fees for use or limit the available hours to send an alert. 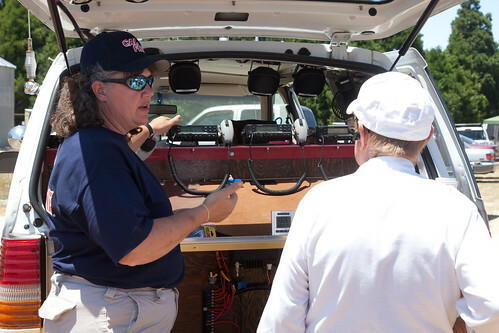 Amateur radio operators have always taken advantage of new technology when it makes sense in filling a need. Examples of this most recently would include digital operating modes, Echolink and IRLP. One of these tools that might be useful for some groups would be the use of Twitter for rapidly sending out club, group or ARES alerts or announcements. Anyone who has a cell phone that can send and receive text messages can easily enable these alerts to show up on their phones, no smartphone or complicated setup required! The next two portions of this article will describe how to set up a Twitter account for your club or group, and the second part will be how a club member would set up receiving those alerts. One option to reduce the number of phone calls you have to make as a part of your phone tree notifications to your ARES group members would be setting up a Twitter notification account. Setting up a new Twitter account takes just a few minutes, and for your members to sign up to receive updates is even faster. 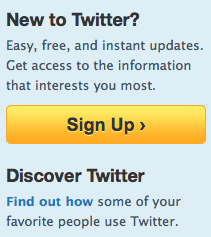 To set up a new account visit http://twitter.com and look for the “Sign Up” button on the right side. For the name, put the name of your ARES group or club. For the username, think carefully about this one as it will be in your URL address, and you won’t want to change it later. For the Santa Cruz California ARES group I chose a naming scheme of “ares_xcz” with the plan that if multiple ARES groups were listed they would be shown together alphabetically. Then I used a three letter county abbreviation. I created the main account, http://twitter.com/ares_xcz, for official ARES activations and alerts. Next choose a password, I would create a strong password that you might share with just a few people in your group so they could post the alert if you were unavailable. Board members or the club president would be some examples of who you might grant posting access to. Next put in an email address (your own, or a club email address) that gets monitored regularly. Answer the other simple questions asked and click the “Create my account” button. You can then customize your page if you choose, add your organization logo, and write a description of the group with a link to your website for more information. To post a “Tweet” or an alert to your group, simply type the text in the “What’s happening?” box at the top and hit the “Tweet” button. Remember, Tweets are limited to 140 characters so they are easy to read on cellular phones via SMS, so keep it short. Your tweet is available to anyone who looks at your Twitter account or uses the search feature. A common method is to post the short alert message with a link to additional information. For our group I also created a second Twitter account for more general news and non-priority information like meeting reminders and announcements: http://twitter.com/ares_xcz_news. For your group members to receive alerts whenever your organization posts a message is easy. From their mobile phone they would simply create a new text message. In the “To” field of the message is where you typically put the cellular phone number of who you want to send the message to, but in this case, Twitter’s number is 40404, so place that in the “To” field of the message. In the message portion, simply write the word “follow” and the name of the Twitter account for your organization. As an example, to follow all alerts for the Santa Cruz California ARES group, the message would be “follow ares_xcz”. Send that message and Twitter will reply with a few very basic instructions. The next time the organization posts a tweet, your phone will receive a text message within seconds. If you ever want to turn off these updates, simply send a text message of “leave ares_xcz” to 40404 and it will turn the notifications off. There are a lot of other features of Twitter, through the website you can read the tweets online, search past tweets, locate additional people, ham radio operators or organizations to follow, and more. If you want to get started to see how some amateur radio operators are using Twitter, check out http://hamtwits.com. Out of all the years I’ve been involved in amateur radio, and all of the years I was interested but not licensed, I’d always heard about Field Day, but until this year had never actually attended. Most years I had weddings I was photographing, or other schedule conflicts that prevented me from joining in, but this year worked out perfectly. I took Daria with me (7-months old) and she did very well the whole time we were there. We toured around a little, saw the various stations operating and shared some conversation in the shade. I think what caught my attention most was the satellite station, but I didn’t stick around long enough to really watch them try to make any contacts. Things that I really wish could change at the event was our power sources… we’re in a field of very dry grass, and behind each tent or trailer is a noisy gas powered generator. It’s true that I wasn’t operating myself, and I don’t know the true power requirements of the individual stations, but I would sure love to see more solar and battery power running at future field days. Sure would be more enjoyable without the constant drone of those little generators… not to mention the fire danger! Following our visit to the site, I headed down the hill, was able to drop Daria off at home, then headed for the airport to get a few aerial shots. On my way to the Bonny Doon field day site, I made radio contact with some of the radio operators working the Banana Slug Trail Trials at the Graham Hill Showgrounds and surrounding area. 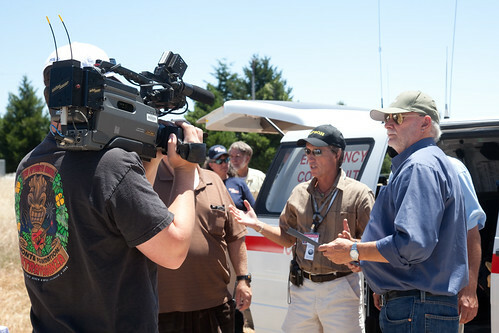 Then I made radio contact and was logged by our field day station. 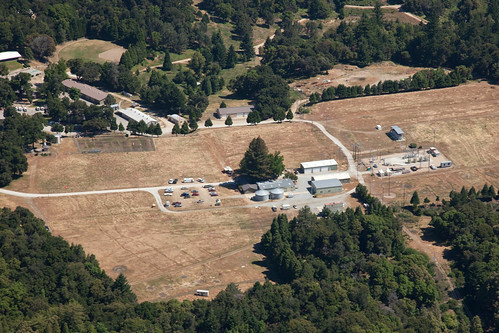 I headed down to the station set up at UCSC on their field, shot some aerials of their location but was unable to make radio contact. While trying, K6LY in Monterey caught me and logged me as a contact from the plane as well. 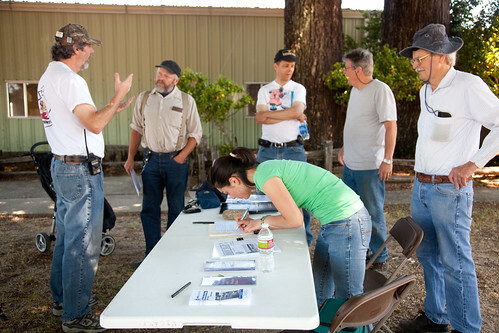 Additional images can be found by visiting my 2010 Field Day Gallery on Flickr. This morning in Santa Cruz, there is a county wide hospital evacuation drill taking place. To monitor the drill, listen in on the K6BJ repeater at 146.790- PL 94.8 from 8:30 am – 11:30 am. The Santa Cruz County Public Health Department will stage an evacuation drill involving Dominican Hospital, Watsonville Community Hospital and Sutter Maternity and Surgery Center on Wednesday. “Operation Holy Smoke” will take place 8:30 to 11:30 a.m. The drill is designed to test the ability of the community to respond to one hospital’s need to evacuate patients and move them to a different facility. No actual patients will be moved, but the exercise will examine communications and coordination activities related to a full hospital evacuation. The exercise, funded by a grant, fulfills accreditation requirements for the hospitals. Other participants include the Emergency Operations Center, the Medical Reserve Corps, the Amateur Radio Emergency Services, the Palo Alto Medical Foundation, San Benito County, San Mateo County and law enforcement and fire agencies from Santa Cruz and Capitola. What is Ham Radio all about? Here is a ten minute film from 1939 showing some of what amateur radio is all about. It’s amazing, some things have changed a lot, some things seem exactly the same. It was some of these things that got me interested in amateur radio in the first place! Complexity in setting up APRS iGates… necessary? Pardon my complaining attitude in this post, but maybe there are good reasons. So the basic story is some of us use APRS transmitters to track our location as we move around (be it hiking, biking, sailing, in the car or in a plane). For some of us, our goal is to be picked up by the mapping services online so other people can see our track or present location on a map. Once your data makes it to the internet stream, it can be mapped, archived, or used however you like. The problem is, a lot of APRS packets are lost before they ever reach the internet, there are simply not enough iGates in some areas to pick up the packets. With that being the problem, I wanted to build up a simple iGate and be able to gate local packets down in the valleys in which I live out to the internet. Should be easy… I’ve got computers with sound cards, I’ve got radios and scanners… but then it comes to the software. Almost every time I have gone looking for good software to use it turns in to a crazy story of needing to install linux, install Windows XP, read a mountain of documentation, chat on forums for days attempting to work out the configuration files, etc. I wonder why it has to be so difficult? Has there ever been on off the shelf self-contained hardware APRS iGate with a web interface for configuration? Would their be a demand for it? * An ethernet or WiFi network interface to give it internet access. What might it look like? I’d envision something like the SheevaPlug computer with an audio line in jack, or a USB TNC. How would it all work? You’d receive the device, power it on, connect to it via the internet, put in your callsign, and by default, it would start gating received packets on 144.39 to the internet. Done. For more advanced features, you’d simply pull up the configuration file that would have various user defined settings, each with a good description of the possible settings and how they work. (Filter out specific types of packets, change the receive frequency, setting the iGate’s lat/long position, changing the APRS-IS server locations, etc. Perhaps the existing systems are good enough, but it just seems like there should be some “plug-and-play” style iGates out there to encourage people to set them up so our packets could get received in more locations. Though not radio related, I wanted to share this recent discovery of mine since the solution took me a bit of work to discover, and I hope this might help others stuck in the same situation. One of my laptops recently was unable to access specific URL’s of a very few sites. I believe my desktop machine previously had the same problem but with different URL’s. I would type in the URL of the page and it would fail to access it, tried it in Firefox and in Safari with the same result… no page loading. Which I tried and had no luck. I also checked my .hosts file and there was nothing related there. So I searched again tonight and found the solution in several posts! The problem was an application called PeerGuardian which is an utility that is often used when people download Torrents. What it does is block ranges of IP addresses that are thought to be “bad” ranges in terms of Torrents. I won’t go in to the details of why people use it, but once it’s been used, even when the application is not running, some of it’s filters remain in place preventing access to websites on it’s block list. To remedy the situation, I launched PeerGuardian, selected the “File” drop-down menu, then chose “Disable Filters” and instantly my access to those websites was restored. Hope that helps anyone else having the same problem! Is Morse Code still relevant? For Tania it sure is! Apple Lion File Sorting Issue… resolved!